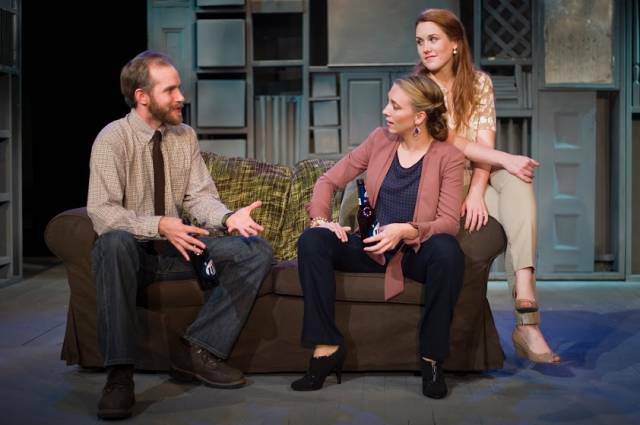 Zac Hoogendyk, Mel House, and Emily Koch in APAC's "In The Bones". Photo by Michael Dekker. I heard it said once that theater is everywhere, but I don't know if I ever really invested in that corny platitude until last Friday, when I had the pleasure of seeing a truly moving piece of stagecraft miles away from the lights of Broadway in a church basement in Astoria. Marking the inauguration of Dev Bondarin as their new Artistic Director, the Astoria Performing Arts Center is now running Bondarin's APAC debut, Cody Daigle's In The Bones. In The Bones is, to put it lightly, a challenging play. It tells the story of a family in Louisiana coping with the loss of a son, brother, nephew, and partner, a young man who commits suicide after returning from his second tour in Afghanistan. We follow them three years in the wake of the tragedy; iPhone videos recorded by Luke, the soldier, before his death lead to an impressionistic blending of the past, present, and future in an exploration of coping with sudden, unexpected loss. Daigle compounds the tragedy of Luke's death by adding an additional layer: Luke is gay, and before he takes his life he brings his partner of four years to Sunday dinner and is met with tight-lipped anger by his mother, Dee. Daigle, Bondarin, and their fine cast reject the melodrama that may seem to come hand in hand with such excessive sadness. Though the play could easily become an anti-suicide treatise, it avoids the somewhat predictable angle of victim-blaming, and wades far beyond that into the murkier realm of what it means to carry on with life in wake of terrific loss, and the ways in which the death of a loved one tears open lives in a way that lingers far after that person is buried. Sean Hankinson delivers an impressive range of performance as grieving partner Ben, who is left to suffer in silence when he is rejected by Dee and forgotten by Luke's aunt Kate and sister, Chloe. Mel House plays the brassy, foul-mouthed Aunt who can't seem to appropriately grieve and support her sister Dee, played with frightening, almost catatonic austerity by Victoria Bundonis. It's an upsetting thing to consider that we might not know those we love as well as we think we do, and Emily Koch bravely plays sister Chloe, struggling with how Luke "continues to reveal himself," and offering hope for future happiness when she finds comfort and consolation sharing her grief and eventually her life with Kenny, an old army friend of her brother's, played by Zac Hoogendyk. In The Bones does not demand, insist, or plead to deliver its message. It offers itself by weaving the audience tenderly into the lives of the family. In subtle strokes, through home videos shown between acts and careful, strong performances, we become a part of the play because we've seen their past and we watch them move into the future. One snippet of video shows Chloe and Ben hamming it up to Luke behind the camera; they're happy, playful, and carefree, demanding he take them out to a big brunch. Several scenes later when Chloe finds a mug left behind by Luke as a gift to her, she recalls that he stole it for her one day after brunch, and we remember that too. It's moments like this, characteristic of the play as a whole, that deny the saccharine emotion that, in the hands of a less capable playwright, could have easily resulted from the complex trauma the play presents. These snippets of past and hints towards the future gift the audience with a more holistic picture of the characters and push the performance into a fuller depiction of lives lived -- something far more difficult to accomplish, yet deeply beautiful and moving. As In The Bones proves, good theater is not always easy. It transports you into the lives of people you may or may not recognize, but forces you in this exploration to see the common threads of human existence. If Astoria hasn't made it on your list yet for must see theatre, give Dev Bondarin a shot with this one, and I promise you won't regret it. At the Astoria Performing Arts Center through November 22.